Last month, in a south Kashmir mosque, a fiery cleric in his raucous voice and shrill cries, defended former Hizbul commander Zakir Musa‘s call for Islamic jihad. For the first time, a cleric, using his religious pedestal, was exhorting his audience to support Kashmir’s most wanted terrorist who recently aligned ideologically with al Qaeda. The audio recording of Mufti Shabir Ahmad Qasmi’s incendiary speech was widely circulated on instant online messaging platforms in the valley. The Mufti very likely converted many of his ardent followers into Musa cheerleaders. Kashmir’s mosques have always been used for religio-political ends, and for separatism since 1989 when the militancy broke out. But the character of the mosque has changed dramatically in the last decade. Hanafi/Barelvi Islam, the traditionally moderate school followed by the majority in Kashmir, is being replaced by the radical Ahl-e-Hadith, the local moniker for Saudi-imported Salafism or Wahhabism. Though many Hanafi clerics like Moulana Abdul Rashid Dawoodi are resisting their Wahhabi competitors, “the attendance in annual fairs of all major Sufi shrines has been decreasing,” said Muzamil, a Sufi practitioner. Of the roughly six million Muslims in the Valley, the once-marginal Ahl-e-Hadith now has over a million followers, claimed its general secretary, Dr Abdul Latif. The Arab funded Wahhabism finds convergence with other already established conservative strains of Islamic movements, such as Deobandi and Jamat-e-Islami in Kashmir. The mufti who made a plea for Musa is a Deobandi from a Jamati household. Such religious intersections are not limited to fundamentalists. Last year, Sarjan Barkati, a self-proclaimed Sufi, earned epithets like ‘Pied Piper of Kashmir’ and ‘Freedom Chacha’ for mobilising people and glorifying the Hizbul commander Burhan Wani who had wanted to establish an Islamic Caliphate. These mutations from moderate to radical have been happening insidiously and manifested themselves in the mob that lynched deputy SP Ayub Pandith on Shab-e-Qadr. The coalescing of all the schools of Sunni Islamic thought in Kashmir is result of a “common broad-based platform, Ittehaad-e-Millat, created to resolve differences” not only among the puritanical groups but also with syncretic Barelvi outfits, said Jamat-i-Islami Amir chief Ghulam Mohammad Bhat. Incidentally, IeM was actively involved in organising protest rallies in favour of Wani last year. Way before Wani was killed, the signs of Wahhabised radicalisation had already begun to emerge. Maulana Mushtaq Ahmad Veeri, for example, was already popular in south Kashmir by 2015 for sermons in which he praised the IS and Caliph Al Baghdadi. 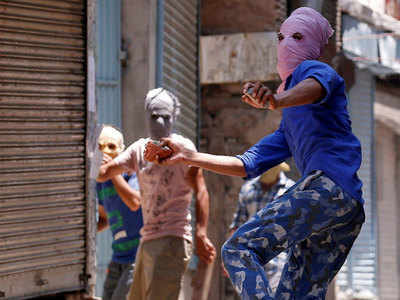 “It was only a matter of time before the youth started waving IS flags while pelting stones, or Wani or Musa declared jihad for the Caliphate. Ironically, many moderate Kashmiri Muslims claim that IS has been created by the US and Israel to malign Muslims,”said a student of religion from Bijbehara. Official sources said that there are over 7,500 mosques and seminaries in Kashmir, of which over 6,000 are Hanafi and around 200 are syncretic Sufi shrines. Ahl-e-Hadith, Deoband and Jamat put together have just over 1,000 mosques and charity based seminaries, of which Ahl-e-Hadith has the largest number. “Ahl-e-Hadith mosques are popular for their modern furnishing and facilities,” said Shahnawaz, a Barelvi follower in Anantnag, adding that the organisation also funds several orphanages, clinics and medical diagnostic centres. Sources said Ahl-e-Hadith mosques and seminaries have doubled in the last 27 years. FCRA annual reports show that top donors to India among the Salafist Islam practising states are the UAE, Saudi Arabia and Qatar. Although it is not clear who the top donor and recipient in J&K is, the state has received between 10 and 100 crores as foreign funds each year in the last decade. Religious scholars in Kashmir point out that Ahl-e-Hadith has four sub-schools—Jamait-ul-ahl-e-Hadith (puritan), Difai (ultra-puritan), Guraba (religio-political ultra-puritans like Masrat Alam), Sout-ul-Haq, represented by ISIS, where a nonconformist is ‘wajib-ul-qatl’ (eligible for murder). A scholar who didn’t want to be named claimed the radical subsects are anywhere between 1 to 5 percent in Kashmir. Ahl-e-Hadith played a role in the separatist movement as a part of the joint Hurriyat Conference until it was split in 2003. The organisation is known to share a relationship with Tehreek-ul-Mujahideen, which is closely associated with Lashkar-e-Taiba. The TuM is a part of the PoK-based United Jihad Council headed by Hizbul Mujahideen commander Syed Salahuddin, who in 2014, had declared support for al-Qaida’s entry into Kashmir. However, security officials believe that the influence of Wahhabi discourse through the Internet, social media and messaging platforms is far more dangerous than the mosques and literature. “Kashmir has around 2.8 million mobile internet users. Even if there is one Salafist preacher glorifying Burhan Wani or Zakir Musa and the clip is circulated over smartphones, it has a dangerous multiplying effect over a huge population,” a senior police official said. Mobile data usage, officials claim, is higher in Kashmir than other parts of the country because of lack of other sources of entertainment. Cinemas, bars and discotheques were shut in Kashmir in the early 1990s when militant groups issued diktats against all things “un-Islamic”.